Available in 35mg (3.5%) and 50mg (5.0%) nicotine strengths. 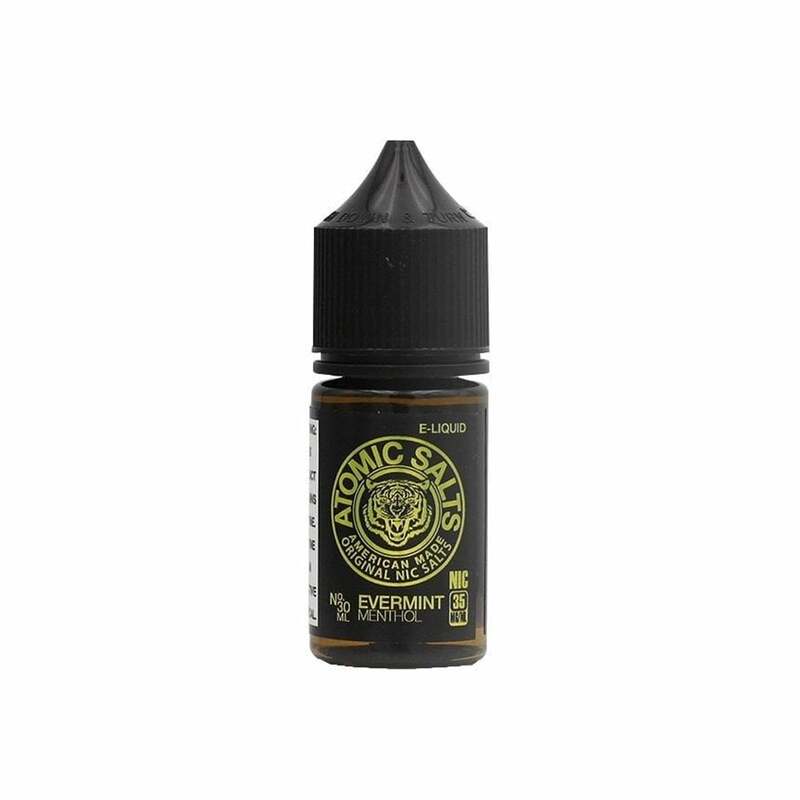 Atomic Salts' Evermint Menthol is a fresh new version of the classic menthol that'll be sure to become your new favorite flavor. It's cool, it's refreshing, and it has a touch of sweet mint to tantalize your tastebuds. What more could you ask for? All these e-juices description offer such nuanced flavor profiles. I consider myself as having a fairly refined palate, but in this one I don't get any "sweet mint" at all. Just a very strong menthol. I was hoping to mix with other flavors but it overpowers everything. Very strong mint flavor. A little too much. Totally awesome much better than prefilled pods. Just like a really good spearmint. This has been my go-to juice while transitioning off menthol cigs. I use the Smok by Infinix and it tastes fine to me. I started with the 50mg last month and I’m going to try the 35mg next. I have to amend my previous review. The mint flavor is indeed a little too strong to use as a daily vape flavor. If you want to dilute it, that might be one route to go. But if you're looking for one flavor to puff on throughout the day and you are more than a once every 15 minute vaper, this will probably be too strong for you. As many reviewers have said, this is a fantastic minty menthol; esp. for the price! Perfect mix of mint, menthol, sweetness AND throat hit. it has a very strong mint taste that's cold and smooth. personally, I get bored of the taste after a couple of vapes. but it's not a bad juice, great value and similar to Juul mint. OMG. I'm in love. We are always looking for STRONG menthol e-liquid & we've found a couple that we really like, but our favorite one [prior to ordering this] happened to be the most expensive & hard to find. So when I saw the reviews from others saying that Evermint Menthol was strong & both minty and menthol (those two are not mutually exclusive -- I've had a number of MINT flavors with zero menthol in them) & the price was astonishingly affordable, I had to try it. The price made it so that even if we hated it ("we" = me & hubby), it was an amount we could deal with losing. But there's no losing with this liquid! I mean, if I could, I'd be using all sorts of expletives to describe Evermint Menthol. Simply put, it's one of the best menthol flavors I've ever come across & I'm in my 6th year of vaping! I'd give it 10 stars! I got the 50mg and used this in my Minifit. I was worried the mint would overwhelm me like other reviewers mentioned, but it turned out to be just the right amount. Definitely minty. Tastes like that doublemint gum. I'd say it seems more like mint than menthol. Pleased with this purchase. The mint really comes through ar first with the menthol burn afterward. I am not a regular menthol vaper but was looking for something different. I think menthol lovers would really like this. Tastes like a mint Altoid . This E-Juice is a bit too strong for me but I have been mixing it with another E-juice to enhance it.. I've yet to find a mint flavor as good as Juul makes.. So awesome better than the juul mint.. I will keep ordering it. Possibly the most methol heavy flavored liquid I have tasted. Like others state, perhaps a bit overboard with the mintyness. Got this looking for a Menthol that packed a punch to the face. This was definitely it. It can be a little strong almost Halls cough drop like on its own.. but I like to mix mine in with iced fruit flavors for an extremely icy feel. Will last me a while because just a little drop does the trick. Very good flavor and throat hit is on point on my Novo, juice is a bit dark which might affect coil life but flavor is top notch menthol. If you're looking for a strong menthol this is it. Previous pack a Day Menthol Cigarette smoker. This Juice totally satisfies my craving. I do order the higher nicotine. Nice throat hit, better than Juul mint pods.